Twenty three kilometres of the Castelo Branco Highway link peaceful, protected Alphaville to frantic, edgy downtown Sao Paolo. 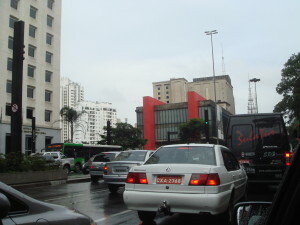 Avenida Paolista is the main drag and the hub of South American commerce. It’s a parade of 21st century global business towers interspersed with the occasional beautiful colonial relic. Trianon Park, a legacy of old Sao Paolo, occupies a block roughly halfway down the Avenue. A small slice of the wild, it looks oddly out of place in this concrete jungle. Palms and plants of Triffidian size and appearance press against its wrought iron fences as if straining to escape and retake the city. Armed guards defend the park against invasion by the poor skinny, ragged homeless kids who run wild in Sao Paolo’s streets. The street kids are never far away. They hold noisy and chaotic court, across the road from Trianon Park in the open space under the Museu de Arte de Sao Paolo. Designed by Lina Bo Bardi, MASP, as it is familiarly known, is a Sao Paolo landmark and a star among modern Brazilian buildings. The concrete and glass cube, supported on massive red beams, dominates the mid-section of Avenida Paolista. Founded in 1947 by “the King of Brazil” philanthropist and Media Magnate Assis Chateaubriand and Italian Professor and Art Critic Pietro Maria Bardi, the Museum houses the largest and most impressive collections of art in South America. It includes centuries of European Art along with African and Asian collections. There are also antiquities and decorative arts from around the world. The South American and Brazilian collections are highlights of MASP. All the Latin American greats are there, including personal favourites Torres Garcia and Diego Rivera, Di Cavalcanti and the poignant and beautiful Candido Portinari. MASP is a non-profit making private institution and its entire collection is listed as Brazilian National Heritage.